Home / ADAPTATION / TALK OF THE TOWN / Get Re-aquainted with the Beloved Characters of "Beauty and the Beast"
Get Re-aquainted with the Beloved Characters of "Beauty and the Beast"
With barely three weeks before Disney's live-action Beauty and the Beast bows on the big screen, the studio has released the official descriptions of the beloved fairy tale's characters. And when searching for talent to bring the beloved animated characters to life on screen, the filmmakers canvassed the worlds of film, television, music and theatre to find the performers best suited for each role. BELLE (Emma Watson) is a bright and spirited young woman who dreams of adventure, romance and a world far beyond the confines of her French village. Fiercely independent and keeping to herself for the most part, Belle wants nothing to do with the town’s arrogant and boorish rogue Gaston, who relentlessly pursues her. 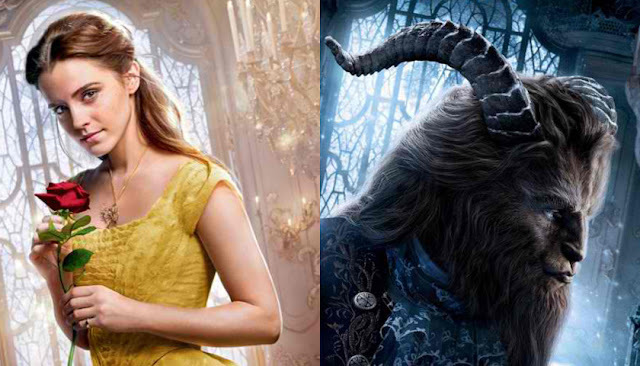 When her father is imprisoned in the castle of a hideous Beast, Belle trades her own freedom for his and quickly befriends the former staff who have become household objects as result of a curse placed on the castle. The Beast, while surly and ill-mannered, can be generous and chivalrous and knows how to make her laugh, and Belle soon begins to sense the kind heart of the Prince within. THE BEAST (Dan Stevens). Once a dashing young Prince who had grown to become cruel and self-absorbed before being transformed by an enchantress into a hideous Beast, he is trapped in the castle until he can learn to love another and be worthy of their love in return, thus breaking the curse. When the Beast catches Maurice trespassing and takes him prisoner, his beautiful and headstrong daughter Belle takes his place, and the Beast develops feelings for her, slowly beginning to come back to life. 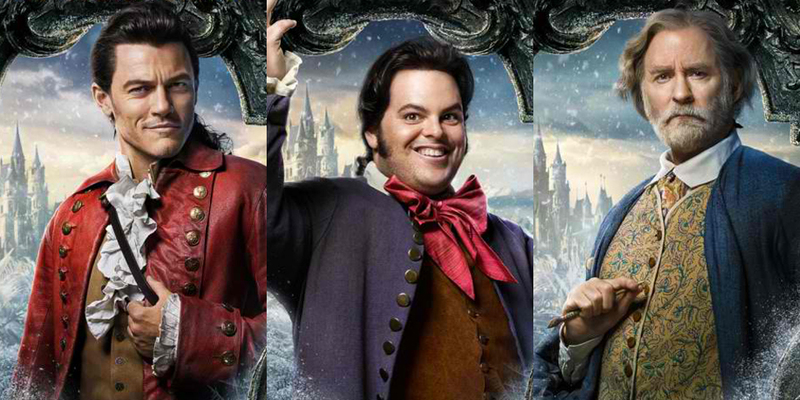 GASTON (Luke Evans) is the arrogant and shallow villager intent on marrying Belle. A former War hero, he holds court in the village tavern and has every eligible woman in town wrapped around his finger. Smitten with Belle, who is strong-willed and impervious to his charms, Gaston becomes consumed by rejection and jealousy and leads a mob of villagers to the Beast’s castle to rescue Belle and kill the Beast. LEFOU (Josh Gad), Gaston’s sidekick, is not the brightest bulb in the box. He worships Gaston, who has no regard for him whatsoever and makes him the brunt of his jokes, but soon comes to realize that beneath Gaston’s handsome exterior lays a heart that is much darker. MAURICE (Kevin Kline), Belle’s father, is a reclusive artist who specializes in beautiful one-of-a-kind music boxes, which to Belle represent the world beyond the confines of Villeneuve but to Maurice are a way to protect his daughter while preserving perfect memories from his past. When Maurice stumbles upon the Beast’s castle and is taken prisoner, Belle comes to plead for his release, eventually trading her freedom for his. Now it is up to him to convince the villagers of Belle’s imprisonment and to find a way to set her free. LUMIÈRE (Ewan McGregor) is the Prince’s proper French valet who becomes a gilded candelabra as a result of the spell. While frequently at odds with Cogsworth, the mantel clock and besotted with Plumette, the feather duster, Lumière is charming and sophisticated, and can turn an ordinary meal into a musical extravaganza. 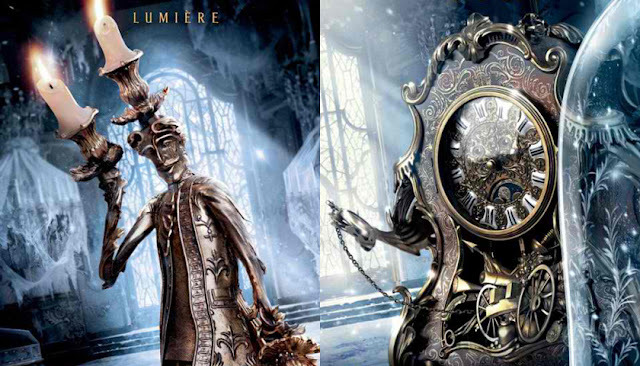 COGSWORTH (Ian McKellen). The castle’s fastidious and tightly-wound head butler who is transformed into a mantel clock by the curse of an enchantress, Cogsworth detests any kind of disruption, preferring things to run like clockwork. 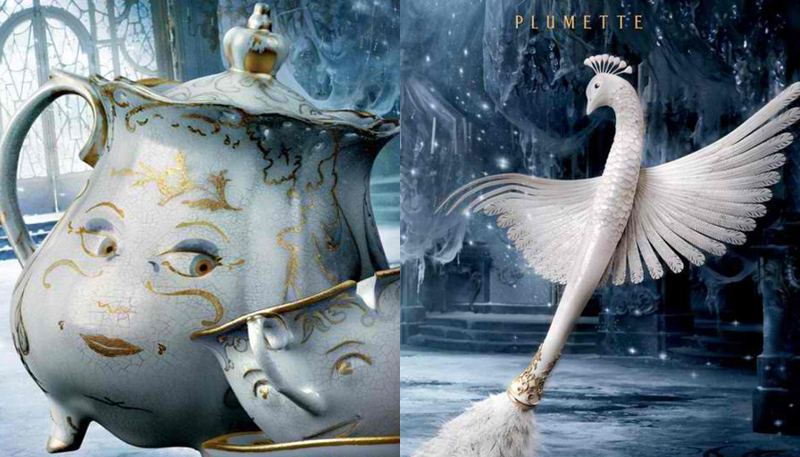 MRS. POTTS (Emma Thompson) and CHIP (Nathan Mack). The castle’s former housekeeper, Mrs. Potts, is now a teapot with her Cockney brogue still in place. Her son Chip, who has been transformed into a teacup, is trapped in the castle with her and the other castle staff. It is Mrs. Potts who takes Belle under her wing and who convinces the Beast to try and woo their new houseguest, hoping that she may be the one to capture the heart of the Beast. PLUMETTE (Gugu Mbatha-Raw) is the castle’s former maid turned cheeky, yet graceful, feather duster who has captured the heart of the candelabra, Lumière. MADAME DE GARDEROBE (Audra McDonald) is the renowned Italian opera diva performing for the Prince when the spell is cast, becoming an enormous wardrobe. She resides in Belle’s room at the castle, and in addition to dressing Belle, has a flare for the dramatic and a proclivity for frequent naps. MAESTRO CADENZA (Stanley Tucci). 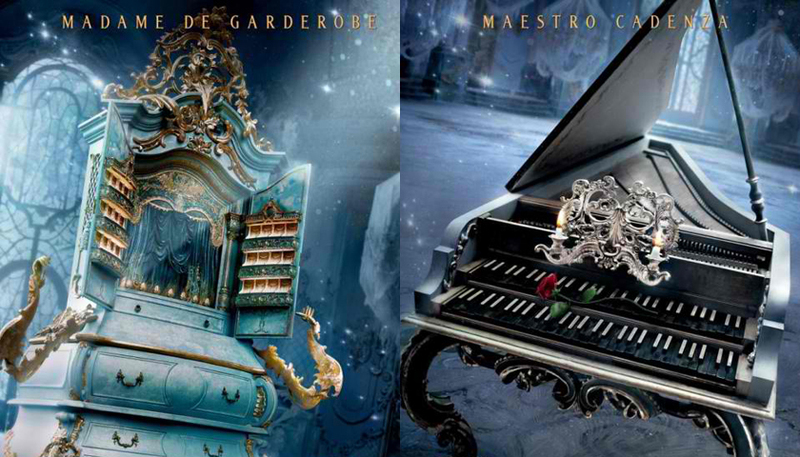 Now a harpsichord (with a considerable number of broken keys) following the curse of an enchantress, Maestro Cadenza is husband to – and accompanist of – the celebrated opera diva Madame de Garderobe, who, along with his wife and their dog, Froufrou, are trapped in the castle awaiting the lifting of the curse. Opening across the Philippines on Thursday, March 16, Beauty and the Beast is distributed by Walt Disney Studios Motion Pictures International. Like us on Facebook, WaltDisneyStudiosPH; follow us on Twitter, @disney_phil; follow us on Instagram, @disney.ph and use the hashtag #BeOurGuestPH.